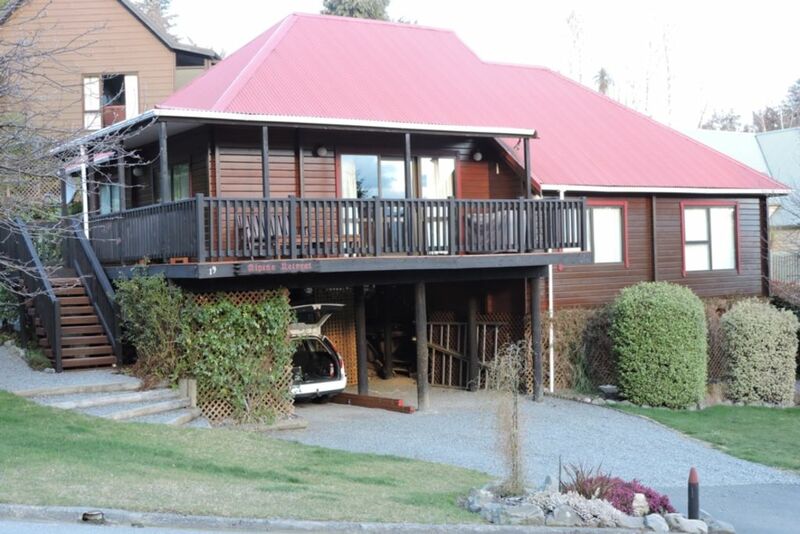 Alpine Retreat is a modern split level Holiday Home facing Conical Hill, with mountain views towards the Lewis Pass. Alpine Retreat is sited in the centre of Hanmer Springs, within ten minutes leisurely walking (800 metres) to the Shops, Bars, Restaurants and Thermal Pools. There is easy access to walking and bike tracks. The house is air conditioned / heat pump - very cosy in winter. There are a number of DVD's, CD's, Videos (suitable for adults and children) and books for your enjoyment. Sky sport also available. The house has an alarm for your security. Although the house sleeps 8, it is only suitable for up to 6 adults with family. There is one bathroom which has a separate shower and bath. The kitchen has Microwave, Nespresso coffee machine (pods BYO) , all necessary utensils. There is a large outside Deck with Barbecue and outdoor tables and chairs. There is a gate at the top of the entry steps to keep children safe. Weekends are strictly Friday and Saturday (2 night stays). Sunday night is classed as midweek rate. Long weekends are strictly a 3 night stay. We have midweek rates Sunday through to Thursday nights which will suit shift workers,holiday makers and those with young families. Guest in from 2 pm on day of arrival. Depart by 11am on day of departure. Stay 7 nights and receive a 15% discount. Deposit of 25% of rental to confirm booking. Balance of payment 14 days prior to booking. Key is from a lock box on the property. We expect guests to respect our home and the peace and quite of our neighbours. Sorry but persons under 20 years, not as part of a family, are not considered. In the event of unsatisfactory behavior or activities, we reserve the right to terminate a booking and ask the tenant to leave. We built this property in the 1990's as a retirement investment and a holiday retreat which we use frequently, keep updated and equip for ourselves and our guests. Warm and comfortable home with most of your needs. Handy to the shops, bars and restaurants. Mountain views towards the Lewis Pass and the Conical Hill walking track. On a nice day we recommend a drive over Jacks Pass to Lake Tennyson. Beautiful on a still day. Separate shower and a bath. Separate Toilet. Bring your own Towels. Couch seating for 6 adults. 4 Electric Hobs with Extract Fan. Crockery & Cutlery to cope with in excess of 10 guests. There is a large range of utensils, pots and Electric Fry-pan. Separate kitchen adjacent to Lounge and Dining area. A two stool breakfast bar. 6 dinning chairs at dinning table. Outdoor chairs also suitable for use at the table. Hanmer Springs Golf Club is an 18 hole golf course just 3km away. They do have gear for hire. We had a lovely stay. Clean and tidy with all the facilities we needed. Good situation and quiet. Yes, we would definitely go there again. House was lovely and exactly what we needed. House was clean and tidy although one bed was squeaky. The house was very comfortable. Situated at a great distance from the village. We enjoyed our stay but there was a lot of rules to abide by. We could see a modem but we weren’t given access to the internet, unlike every other place we are staying in! The whole pantry was locked up. No tea, coffee or sugar! Lovely place but not really ‘home away from home’ I’m afraid! Beautiful, clean, quiet character chalet style home. We really enjoyed our stay! Not right in the middle of town but close enough to walk. Our only criticism would be the shower as my partner is 6ft4 and the shower dome plus small area made it a little difficult for him. We had every meal out on the deck overlooking the township, magic. We stayed here for a week in Feb 19 it was VERY HOT . Though we know that there is no control over the weather the air con in this property did not cope with 30 degree days. Would suggest taking a fan with you if you don't handle heat very well . The last night we were there the alarm went off at 2.17 am - we had disarmed on arrival and not used during the duration of our stay, so not sure why this happened but put a damper on the end of a hot stay with sleepless nights compounded by builders working across the road starting at 6.30am. Facilities were good . Hire a Mountain Bike and ride the many tracks that the local Mountain Bike Club are very active in creating. Buy lunch at the local Bakery and picnic in the Dog Stream Reserve. Walk the many tracks: Conical Hill, Woodland Walk, Forest park, Waterfall track to name a few. Have a game of golf at Hanmer Springs 18 hole course or if you are not up to this try the mini Golf or Chip & Putt. After all this relax in the Thermal Pools. Dine in the many village Restaurants & Bars that are only a 800 metre walk away. Finally flop into our beds for a rest. There is a Four Square Supermarket and many shops in the village for souvenirs and anything that you may have forgotten. On a day without wind we recommend a drive over Jacks Pass to Lake Tennyson for trout fishing, kayaking, boating and walking. opportunities, or just the mountain views. Jet Boat the Waiau River or if you are really daring, Bungy jump off the Waiau Ferry Bridge!